The simple answer to this question is botulism. Botulism is a serious food poisoning caused by a toxin (poison) produced by the bacteria, Clostridium botulinum. C. botulinum and its spores are everywhere. It is prevalent in soil and water worldwide. The bacteria and spores themselves are harmless; however, when they grow, they create a highly toxic nerve poison that leads to extreme illness and even death. C. botulinum spores survive boiling water (212°F). They grow well in the absence of air in low-acid canned foods and produce the deadly botulinum poison. Only a pressure canner can heat low-acid foods to the temperature (240°F to 250°F) for the correct length of time required to destroy the spores. C. botulinum is the main reason why low-acid foods such as green beans, vegetables, meats, poultry and fish (pH above 4.6) must be pressure canned. Certainly no one wants to serve a food that puts their family or friends at risk. Remember that pressure canning is the only safe method of processing for low-acid foods such as vegetables, meat, poultry and fish. Follow a tested, proven recipe for each food being canned; doing so is critical to safety. Reliable sources for tested recipes include the Clemson Home & Garden Information Center (hgic.clemson.edu), the University of Georgia’s National Center for Home Food Processing and Preservation (nchfp.uga.edu), the Ball Blue Book Guide to Preserving, the Ball Complete Book of Home Preserving, the Jarden Foods (Ball) website (freshpreserving.com) and the references listed below. Avoid other on-line recipes and old untested recipes. 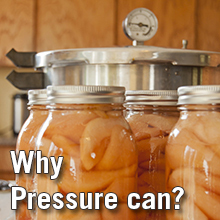 Be sure to read your manufacturer’s instructions on the use and care of your pressure canner. Dial-gauge canners must be tested for accuracy every year before the canning season. Call your local Extension service office to make arrangements to have your dial-gauge canner tested. Prepare jars and lids. Discard jars with nicks, cracks and rough edges. All canning jars should be washed in soapy water, rinsed well and then kept hot. Use new two-piece lids and follow the manufacturer’s instructions for treating them. Prepare food according to the tested recipe. Fill the jars as described in the recipe. Allow proper headspace, remove air bubbles, wipe jar rims and put on lids. Close the vent using a weight, valve or screw, depending on the type of canner. For a dial-gauge canner, let the pressure rise quickly to 8 pounds of pressure. Adjust the burner temperature down slightly and let the pressure continue to rise to the correct pressure. Start counting the processing time as soon as the pressure is reached. For weighted-gauge canners, let the canner heat quickly at first and then adjust the heat down slightly until the weight begins to rock gently or "jiggle" two to three times per minute, depending on the type of canner you have. Start counting the processing time as soon as the weight does either of these. Process for the time and at the pressure recommended in the tested recipe. If at any time the pressure goes below the recommended amount, bring the canner back to pressure and begin the timing of the process over, from the beginning (using the total original processing time). Let the pressure in the canner drop to zero. Do not rush cooling by setting the canner in water or by running cold water over the canner. Never lift the weight or open the vent to hasten the reduction in pressure. Forced cooling may result in food spoilage. Use a jar lifter to carefully remove the jars from the canner. Place the hot jars on a cake cooling rack or dry towels. Leave at least 1 inch of space between the jars. Test lid for proper seal. If a jar is not sealed, refrigerate it and use the unspoiled food within 2 to 3 days, reprocess within 24 hours, or freeze. Label and store jars. Remove screw bands from sealed jars; wash, dry and store them for later use. Wash food residue from the outside of jars and rinse. Label, showing contents, date and lot number. Store in a clean, cool, dark, dry place. Do not taste or use spoiled canned foods. A bulging lid or leaking jar is a sign of spoilage. When opening a jar, look for other signs such as spurting liquid and off-odor or mold. Dispose of sealed jars or decontaminate open jars as indicated in HGIC 3040 Canning Foods at Home. HGIC 3030 What Does pH Have to Do with Canning Foods? So Easy to Preserve, 5th ed. E.L. Andress and J.A. Harrison. 2006. Canning Meat, Poultry and Game. pp. 89-91. The University of Georgia Cooperative Extension. USDA NIFA. 2009. Complete Guide to Home Canning. Agriculture Information Bulletin No. 539.